iDream is a two column blogger template with sidebar to its right and post section to left.The theme is designed by templatsenext and converted by me to blogger.The design is simple and it looks stunning as have high quality colors and some images.Top menu links are ready for you.Seo for title has been done and it supports all blog features and is compatible with all browsers.Search bar is ready in the blog.Three column footer has been made to add your extra widgets in template.Rss feed widget is also ready at top of blog. Other blogger templates you may like are Blacko and Emperors. 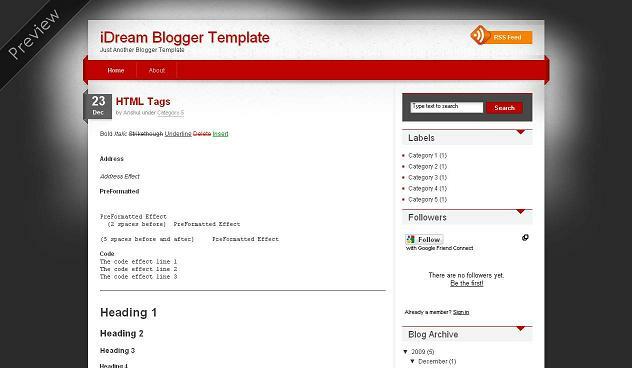 Beautiful iDream blogger template that's good work. any magazine/news template 3 column right? @naked i hav mentioned how to chnage sponsor in template installation of emperors template post. nice template. thanks. i also created a template blog its all my own templates. and i would really appreciate it, if you want to share. @aDmin you just inspired or copied both designs from web2feel and bloggerplugins blog. @hendra ohh ya sure i would love to share these hacks but i have to hold an tutorial for these.As me going to start tutorials on this blog again so just wait for some time to get that tutorial. Hello, i have a problem, your template its really good, i want to use it, but i get an undefined-undefined in the date, can you help me with that error? @nicolas read our FAQs page you will get your answer there. I love this template, i have used in my blog.